Suspension travel makes grip plus lots going on in center and diffs there. Yh smart driver can allways find other ways lines to go with its car capabilitys. 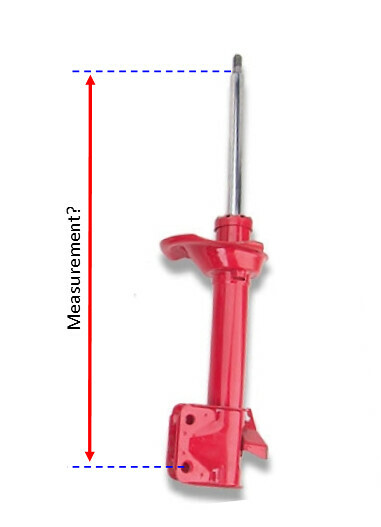 Red, how were these measurements of the original shocks taken? Like this or something else? I ended up buying 210mm stroke front and 300mm stroke rear as you would see in later posts. Toh/Hotbits figures matched my oem shocks perfectly when I pulled them out, so I would recommend going with those figures. I do remember being surprised at how much shorter the official figures from brands including KYB were from oem. Dedman, you want to install a 3" body lift by the lengths you are giving ! Jeremiah22 sorted out the figures you need as he has already done it. Planning on a 2" body lift with 4.5 inch over standard front struts and 5 inch over standard rear struts. I have been told 2.5 on the front of an SG is workable. Jeremiah22 has the figures for the SF. I think it will be different for a gen2 SG (which I have now). Sure did, thanks mate. Just haven't got around to replying yet. I pulled the SG struts and measured them. SG5 ('03-'05) center of lowest bolt to top of thread is 600mm, or to first step is 562mm. Shaft stroke 185mm. Center of lowest bolt to spring perch 225mm, spring perch 2mm, spring perch to end of housing 150mm.